Our volunteer instructors and activity leaders are the heart and soul of our branch. This month we celebrate Barbara Folmer and Monty Pratt from Hiking & Backpacking. Our branch wants to give a big shout out to Barbara Folmer and Monty Pratt! Your hard work is a huge asset to the Foothills community. Thank You! Barbara was born and raised in western Washington and lived for short periods in the Midwest, Africa, and Asia. While all these places are great, Washington has always been home. A lifelong hiker and backpacker, Barbara joined The Mountaineers in 2007 because she wanted to go snowshoeing and thought it wise to take a class first. As she learned more about the club, the Conditioning Hiking Series (CHS) and Alpine Scrambling courses piqued her interest. Barbara made a plan for meeting her adventure goals: snowshoeing followed by a summer of conditioning hikes. Then, she’d tackle the scrambling course. As Barbara pursued her individual goals, she began transitioning into leadership. In CHS, the leaders were so helpful and positive that Barbara decided to give back by becoming a leader the next year. She met Chris Caviezel - who was looking for leaders for a series of hikes exploring the PCT - and the adventure continued. Barbara has had many great experiences as a Mountaineers leader. 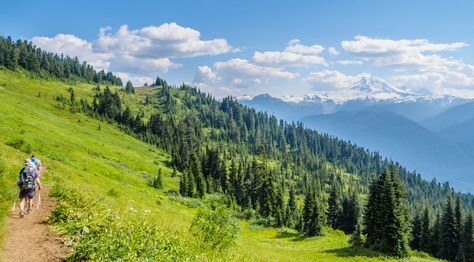 People still tell her that a 2011 hike – when Barbara led participants from Summerland to Panhandle Gap, Indian Bar, and the Cowlitz Divide – is their favorite ever. She is delighted to have shared a favorite experience with great people. Work brought Monty to Seattle in 1979. One of the things that attracted him to the Northwest was its reputation for outdoor activities. He was soon enjoying the area's skiing and hiking. His son joined the Boy Scouts, and Monty participated in many of his son's outings. He wanted to expand his hiking and backpacking skills, so he joined The Mountaineers in 2008. Several people encouraged him to lead, so he became a hike leader later that year. 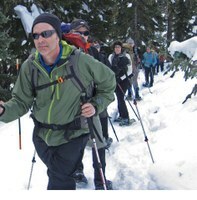 After joining the Foothills Hiking Committee, Monty became involved in the After Hours program and the PCT Series. He particularly enjoyed the After Hours hikes because they covered many of his favorite trails along the I-90 corridor. When the B3 Backpacking course started in 2013, Monty volunteered to lead B3 backpacks, and since then has played a key role in the leadership and administration of the program. He is very proud of his association with B3 and thinks that the information and leadership is first class. Monty's favorite places in the PNW backcountry are around Mt Rainier. He has hiked, scrambled, and snowshoed the park and enjoyed its many different terrains and views. As he puts it, "I have never been disappointed by doing a trip to Mt. Rainier."